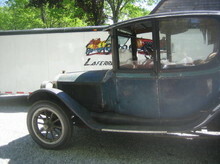 The name Stanley has become almost synonymous with American steam automobiles. Though not the most productive of American steam car builders, the Stanley firm produced steamers for the longest period of time, and the mystique of the Stanley brothers helped elevate their cars to legendary status. The identical twins Francis Edgar and Freelan Oscar Stanley from Maine successfully created a company making photographic plates for cameras. In 1897 they built a lightweight buggy-style steam car and were soon producing them in quantity. The sale of this business in 1899 resulted in the production of Locomobile and Mobile steam cars. Two years on and F E and F O started making steamers again in Newton, Massachusetts, and soon adopted a design feature that defined the Stanley steamer: a horizontal twin-cylinder rear-mounted engine driving the back axle through spur gears. The rest of the vehicle largely followed their original concept with the boiler located under the seat of a tiller-steered runabout. For 1905 they introduced wheel steering and moved the cylindrical boiler to the front of the car, the result being the 'coffin-nose' Stanley, a pattern that continued for the next ten years. By the time that production ceased some 11,000 steamers had been made and for many people the name Stanley is synonymous with the steam car.